Alien has the very important job of keeping the stars shiny. It's a full time job. He doesn't even have time to make friends or have fun. Despite all his efforts, one day the stars just went out. That was catastrophic! All he tried to fix it failed, so the Star HelpLine suggested to get some magic varnish at planet Earth. His arrival was a little troubled, since aliens float on Earth, but luckily he met a boy named George who happily helped him to make his way to the hard store and buy all the magic varnish they could carry. George also invited Alien to play with him, and they had a great time together. Alien couldn't believe how much fun was to have a friend! He felt so happy! And then he saw the night full of bright stars. He realized friendship was all the varnish he needed. It was time to came back to his planet, but George and Alien promised to be friends for ever, to grant a shiny, glowing, sparkling sky in the night. Beautiful story about the importance of friendship to keep us healthy and bright. The text is simple enough to be read to toddlers too. I also loved the illustrations, colorful, smart, and sometimes crayon-like. 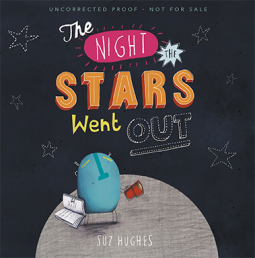 As far as I know this is Hughes first book as author besides illustrator, and it's wonderful.